The onions and garlic in this onion dip are roasted in the oven until they are caramelized and sweet. Roasting the onions in the oven rather than caramelizing them on the stovetop also makes this recipe super easy and mostly hands off. When I finally took a taste of this onion dip, I pretty much decided to skip dinner and just eat this dip. I served this slow-roasted onion and garlic dip with crinkle-cut salt and black pepper kettle cooked potato chips and halved radishes for dipping. So incredibly delicious. The onions and radishes are all from my cousin's backyard garden. I've mentioned her in several posts, including this zucchini sandwich bread, this air fryer cheesy vegetable tart, this summer squash succotash, and this butternut squash and ginger soup. I really don't need to visit farmers markets when she keeps leaving flats of home grown vegetables on my door step. Here's an example. By the way, I never get to keep the little jars of jam because my kids keep stealing them. 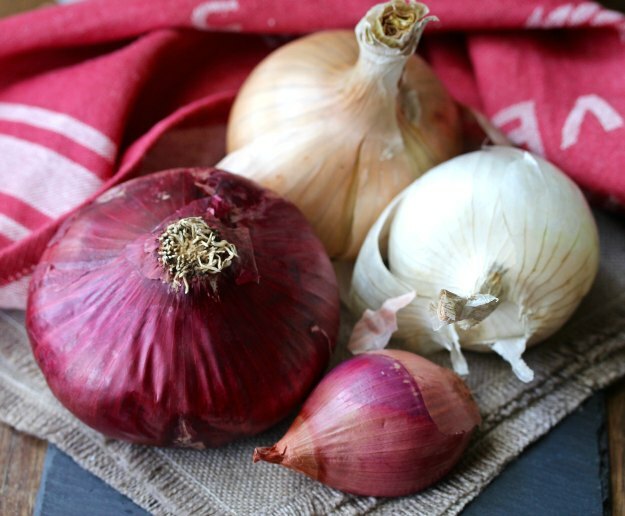 For this dip, I used a combination of white, red, and brown onions, along with some shallots I had on hand. 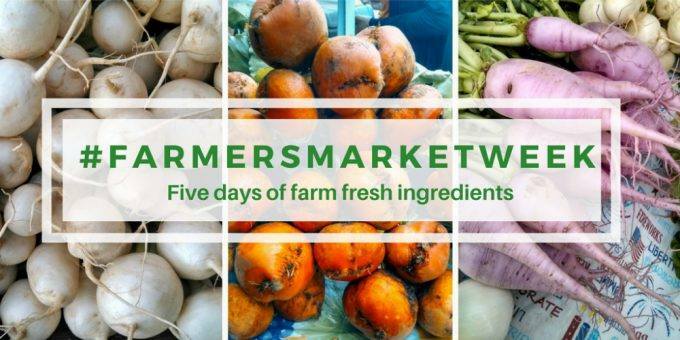 While most people get excited about tomatoes, squash, and other veggies, I get seriously giddy about onions. Fresh onions are juicy and delicious. Even though slicing them makes me cry, it's totally worth it. I served this dip with potato chips and radishes. 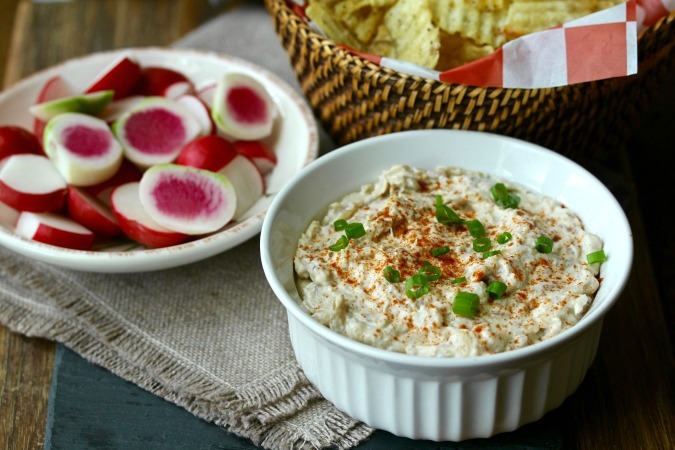 I bought a bunch of red radishes for this recipe, and then my cousin gifted me with a bunch of "inside out" white radishes, so I served the dip with both. I took some to work, and everyone loved the presentation and the flavors. 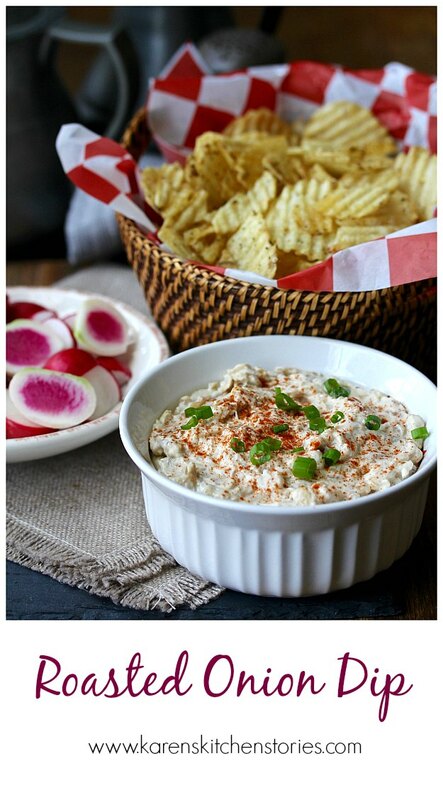 While I loved the black pepper potato chips with this dip, using the radishes for dipping was also amazing. Make this dip. You'll love it. Peel 1 1/2 pounds of onions, and cut them in half lengthwise and thinly slice. Line a rimmed baking sheet with parchment paper. Pour the olive oil and water over the parchment and add the onion slices and garlic cloves and toss to coat with your hands. Season with salt and toss again. Place the baking sheet in the oven and bake for 40 to 50 minutes, tossing the onions and garlic every 10 minutes, until well browned. Remove the pan from the oven and let the ingredients cool. On a cutting board, squeeze the garlic out of it's skin, and smash with the flat side of your knife into a paste. Add the onions and finely chop. Transfer the onions and garlic to a bowl. Add the yogurt and lemon juice and stir. Season with salt and lots of pepper to taste. Sprinkle the dip with cayenne pepper and minced scallions. Serve with the radishes and potato chips for dipping. This recipe was adapted from Bon Appetit. It looks scrumptious! 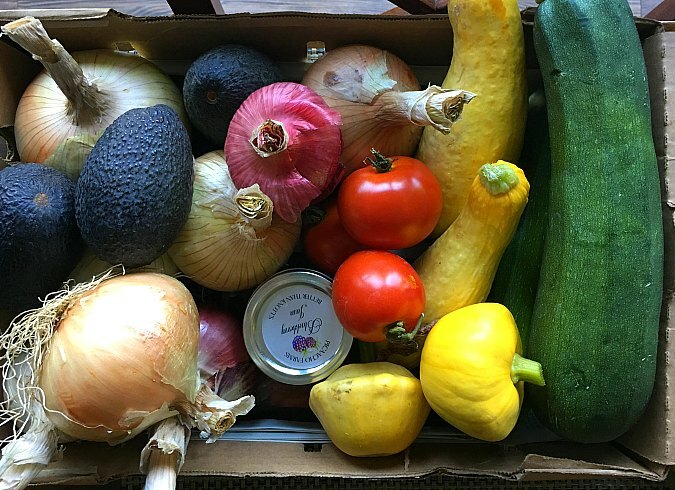 I am a sucker for chips or veggies and dip, so i can't wait to make this for our next get together! Thank you! I've been dying to make a good onion dip. This one is going on the list! Perfect for game day nibbles. This one is definitely the best I've ever had. I took it to work and it was devoured. Oh what a snacky lil' treat...especially with those gorgeous radishes!!! Looks like a tasty snack for entertaining! 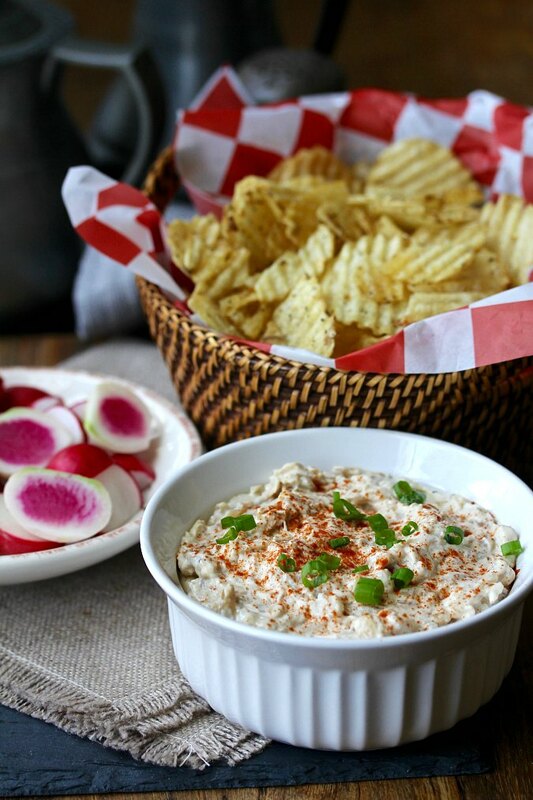 I love the idea of roasting the onions for this dip....I'm drooling just thinking about it. You need to try it Wendy! I love the recipe - homemade onion dip knocks it out of the part compared to the premade mixes... and you're photos - LOVE them! That first one is just stunning! I love the idea of the onion being roasted first, must add a great flavor. Oh my goodness, I love this dip! Love the roasted onion and using the yogurt! Thanks Teri. It definitely is delicious. We love onion dip! I really need to try this recipe. I know my family would love it!